Just to add to the excellent post by Kev on the general subject of what really are Irish foods and what foods are not really Irish at all. So what are Moy park, are they really Irish. Should Irish people and the Irish diaspora, especially support this curious Moy park chicken company that appears to have a bit of a identity crisis. Should Irish people just allow anyone to use Ireland to sell what ever they want? Appropriately their new look .ie Oirish branded website is a bit of fun site, not to be taken serious. Are Moy park really Irish or even primarily Irish? As their advertising clearly implies and suggests as reasons of quality for purchase. Irish? No Moy park are not Irish! This is those Northern British who are all of a sudden Irish if it means making them some money! Moy Park are not Irish! At least not in terms of being a Irish company based mainly in Ireland for business and revenue purposes. Perhaps Moy Park really have proof of their claim that some of their chickens go all the way back to a Donegal King. Seriously though, do any of Moy park chickens really go back to a king of Donegal? More than safe to assume that they could not prove such a Oirish comedy statement. Never the less and of use, claiming so does potentially imply or reinforce a 100% Irish mindset to the naive shopper. Upon examination, it is clear that Moy park are not Irish, at least not in a Irish business main center of business or Ireland revenue paying business. So if Moy park are not Irish, what are Moy park? Are Moy Park really a British mass supplier of chicken meats? Certainly, Moy park are more British than Irish, they are based in NI and pay revenue to the HM Crown of Westminster, and as these other images of theirs boldly suggest, away from obvious sight of naive Irish shoppers. 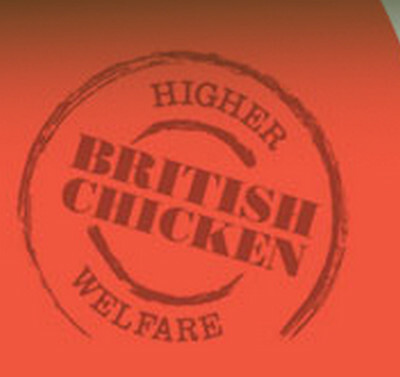 British is how Moy present themselves as, as a British chicken supplier. Jamie Oliver quality British chicken from Moy park? Highlights another chancers credibility. This promotional moy park British chicken idyl video, clearly suggest that Moy Park is both British and exceptional. Perhaps the one farm is really typical of Moy chicken farms, and Moy thereby impress that well known Chicken farmer Charles Saxe Coburg Gotha. Or maybe this point and summary about the reality of Moy park chickens from a industry expert is more typical and reality. by Karen Davis, PhD, United Poultry Concerns, Inc. Confused or suspecting a cynical and selective use of Irish branding? Don't be so sure of your confusion yet, because Moy Park are actually owned by a Brazilian multi national. When Moy park chicken are a British revenue paying subsidiary of Marfrig. 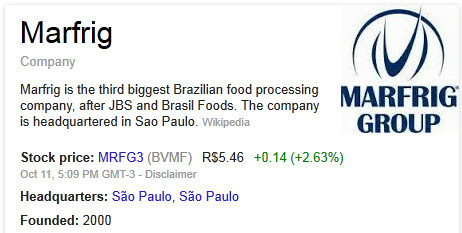 Marfrig is the third biggest Brazilian food processing company, after JBS and Brasil Foods. The company is headquartered in Sao Paulo. The company has an operational base in 22 countries exporting to over 100, and is the fourth largest beef producer in the world. The cynic might second guess that Moy park will eventually be the back door for cheap mass produced low quality chicken into the large European market. After all and as Moy park prove, it is just so difficult to know exactly where a chicken actually comes from in any of these big poultry business. No one will prove that at least some of their chickens were not once Kings of Donegal. There are Business who cynically use Ireland and being Irish when it suits profits, but are not Irish in terms of paying taxes to the Irish revenue, not Irish in terms of production, not Irish full stop. Buy Irish by being certain it comes from a Irish poultry farmer. Once you find one of the hundreds of decent Irish poultry farmers, any difference in cost will be made up by quality. Or choose some hybrid British Brazilian who claim ancient spurious links to Donegal when it suits their Oirish adverts. Moy park not really Irish, is just one of many business & franchises that use Irish and Ireland brands ad hoc. Not even started looking at what the parent company Marfrig are all about. No need to, for sure that is what Irish journalists do on our behalf right! Moy park are just a simple Irish poultry farm, that know all their stock by sight and name, and as for old farmer Moy,why he is real and can personally vouch for and prove the origins of all his stock. If only moy park actually were Irish and doing just that, it would be fine. But that is not the case, and we are left instead to guess why they make their so Irish site so Oirish, almost as if they were trying to tell a story. Buy them Irish politicians and you actively encourage them to take cynical advantage. Why it is important to establish exactly what Moy Park are!